Woollards of Mildenhall is a family run business established in 1947. We are experts in creating customised design solutions for the home, which we can deliver on time and within budget. We pride ourselves in taking care of our customer's needs and providing innovative, tailor-made design solutions to ensure that you find the best products and layouts for your living space. A small selection of our services include design and installation of bedroom furniture, fitted wardrobes, bespoke kitchens and designer kitchens. 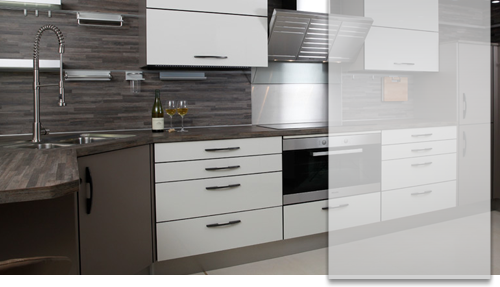 We also supply German kitchens and other continental produced kitchens. Why not visit our kitchen showrooms and browse our current collection. Our aim is to provide absolute satisfaction and a high standard of service with a customer experience second to none. We have over 65 years experience in design, product selection and excellent customer service to develop a fresh and carefully considered approach towards transforming your living spaces with the most innovative design solutions imaginable. If you are searching for quality bespoke kitchens in Newmarket to suit your budget, then look no further. We also cover areas such as Ipswich, Cambridge, King's Lynn, Thetford, Bury St. Edmunds and beyond. We have an extensive selection of german kitchens, bathrooms and luxury bathrooms to choose from. We can also cater for a variety of different tastes and budget ranges. Why not visit our bathroom showrooms to gain advice from one of our designers and see the latest bathroom suites and products that we have on display. Let us work with you to find the best solution to suit your bathroom or bedroom, whether it's to increase storage space, find an improved layout, or simply to update your room. One of our key features is that we have no "salesmen" and there is no pressure. You can choose if and when you would like to speak with one or more of our experienced experts in design. We will not ask you for your name or contact details until you are ready to provide them to us and invite us to assist you with our knowledge and expertise. We are proud of our high standard of service and our ability to provide a unique customer experience. Great savings with the Bosch Winter Sale!